Losing an adult tooth is serious, and getting it fixed is not just a matter of cosmetics. Teeth have an interdependent relationship with the other structures of your mouth and face. Allowing a permanent tooth to remain missing will affect your health. At Newman Family Dentistry we have offer the solution to missing teeth: dental implants. When teeth are allowed to remain missing, you start to lose bone density, which has a series of detrimental effects. First, other adult teeth can shift into the opening, affecting your bite and endangering the rest of your teeth. After that, teeth fall out as their support system has disappeared. Eventually, the face and cheeks can start to look hollow and collapsed, making you look older than you really are. You’re also more at risk for fracturing your jaw because the bone is compromised. Gum tissue in the area also starts to decrease. Eating becomes difficult with missing teeth, as does speaking. All of these consequences combine to negatively impact confidence and quality of life. If you have a missing tooth, it is important that you don’t ignore it. Dental implants are a safe and effective way to replace not just the tooth's crown, but its root--the essential piece in the puzzle of jawbone health. The presence of a dental implant or tooth root stimulates the bone and encourages it to stay strong and maintain a healthy density. In addition, dental implants will not harm your pre existing teeth, and the implants are less prone to decay than your natural tooth. You also will be able to eat and speak as you could before you lost any teeth. All of this will give you your confidence back as you’ll have an amazing, healthy smile. Dental implants have two parts, the root and the crown. The root, often made of titanium, is fused directly into your jawbone. Connected to the new implanted root is a prosthetic tooth crown. This tooth will look, feel, and function just like your natural teeth. These two parts can also be separated, so if for any reason you have a problem with your new prosthetic crown, there won’t need to be a total replacement. If you have lost an adult tooth, don’t wait to contact us. The longer you wait to get a dental implant, the more difficult the treatment becomes, due to the diminishing jaw bone. With less bone to work with, the chances of getting a root to fuse to the bone becomes very difficult. People who have waited to get dental implants often have to receive bone grafts in their jaw before they can have the dental implant, increasing both the cost and the invasiveness of the procedure. Don’t ignore a missing tooth! Contact us or come and see us today. After a brief consultation we can answer your questions and help you to decide if dental implants are right for you. Many patients have found dental implants to be much easier than they had anticipated. Our staff will use their knowledge, experience, and expertise to restore your teeth and leave your mouth healthy and protected from future deterioration. We want you to feel comfortable and informed as we repair your teeth, giving you a positive dental experience. Why wouldn’t we? 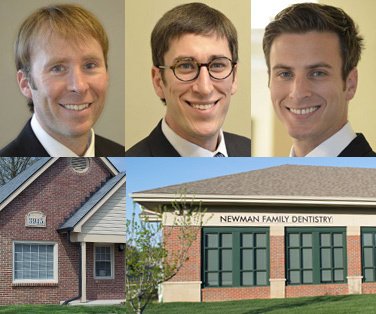 At Newman Family Dentistry, you’re family.